Note: the toolbar is configurable, if you can't see this button - then you need to reconfigure toolbar and add this button). This command is only available for certain types of databases, which supports different user's accounts. There is only FireBird database with these capabilities in initial release of EurekaLog Viewer from EurekaLog 7. This command is disabled for view mode. In-memory and file-based databases do not support user's accounts. You always log as administrator in such cases. 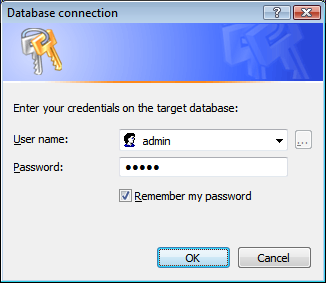 You need to specify a valid user name (login) and password on current database. 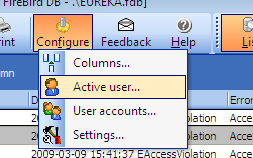 You can change current database in EurekaLog Viewer's settings. Or you can configure user's accounts (if you have rights to do it). Remark: this dialog is a system one, so you can see few strings localized, even if EurekaLog Viewer is in English.